A recent report from Smith Travel Research shows the pipeline of US hotel construction rapidly growing in the Select Service market.1 Key drivers for this growth are founded primarily on meeting the evolving needs of guests while also leveraging the cost efficiency of Select Service brands to increase profit margins. As more of these properties open their doors, they face an increasingly competitive landscape full of other hotel chains, home sharing options, and independent B&B’s. How do hoteliers effectively position and manage their property to differentiate from the competition? Last fall, we asked 300 hospitality professionals to share their perspective in a survey. In this blog, we’ll break down some of the survey feedback, or you can download the full report here. Our survey respondents identified Customer Relationship Management as their top technology priority. Whether focusing on the needs of transient guests or those visiting your property as part of a group, the ability to understand, document, and deliver on customer expectations is important to establishing loyalty and winning repeat business. With such a tight profit margin to balance, filling hotel rooms and event space is essential for Select Service hotels. Every General Manager knows that a hotel room (or function space) that remains empty today can’t be sold tomorrow. So it’s no surprise that defining a strategy to book space and increase revenue is a top priority. Beyond booking rooms at the right rate, how you deliver on customer expectations once they are sold has a direct correlation to profitability and the future success of a hotel. Operations teams are the front line of customer service. Historically, the cost of poor service has been hard to measure. However, today’s technology advancements provide teams the tools they need to deliver exceptional experiences while also providing management teams with quantifiable data to ensure their hotel is operating at the highest level. With top priorities focusing on proactive incident resolution – addressing issues before they impact a guest – as well as addressing guest requests that do arise, there’s no doubt that alerting staff to a need in real-time will ensure that guests expectations are met and a favorable experience is achieved. Interestingly, the top concerns of Select Service hoteliers align fairly closely with the concerns of their Full Service counterparts. However, the available resources to address these concerns differ drastically between the two segments. Whether in reference to available team members, technology, or budget, Select Service properties must approach these needs differently. 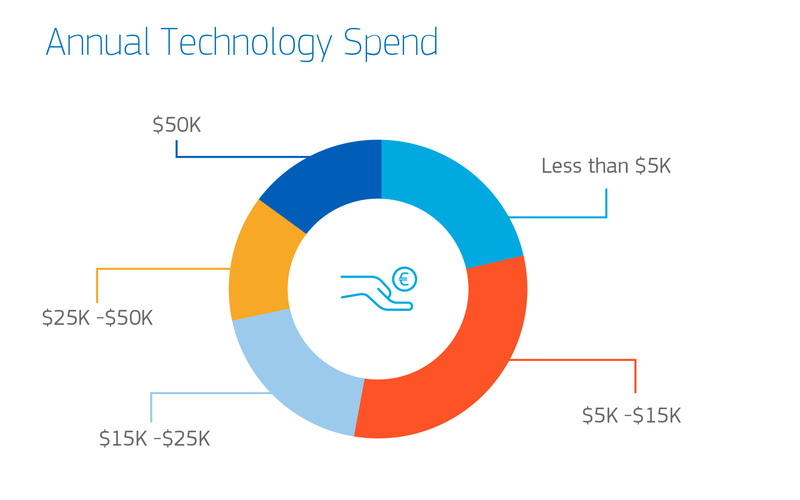 Our survey found the median tech budget for Select Service hotels to be $5K-$15K with 36% of respondents falling within this range. With so many competing priorities, it’s essential that any technology investment be designed to uniquely meet the needs of this market – and at the right price. As more technology offerings become available to Select Service hotels, a General Manager must consciously decide what tools will best enable their team. Understanding that every dollar spent is closely monitored to ensure it’s making a substantial contribution to the bottom line, hard and soft benefits must be considered. Look for technology that fits your business goals and empowers staff with minimal training time. By partnering with a provider with a proven track record of success and the customer support to back it up, you’ll take the stress out of the purchase process while positioning your hotel for long-term financial growth. For more information, download our study to learn how Select Service hotels are using technology to increase revenue, reduce costs, and satisfy their customers.